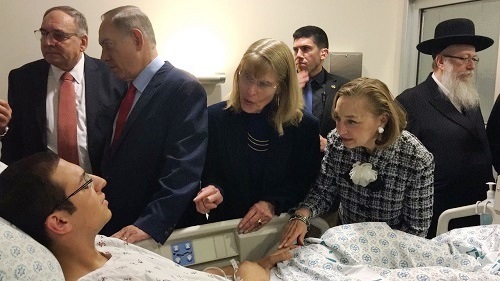 Prime Minister Benjamin Netanyahu and Health Minister Yaakov Litzman visited terror victims hospitalized at Hadassah Hospital Ein Kerem after a terrorist rammed his flatbed truck into a group of soldiers on an IDF cultural field trip in Jerusalem. Four were killed, and 11 patients underwent treatment at Hadassah hospitals: 9 at Ein Kerem and 2 at Mount Scopus. Prime Minister Netanyahu and the health minister gave a national press conference at the Intensive Care Unit of the Sarah Wetsman Davidson Hospital Tower, joined by Hadassah President Ellen Hershkin and President/CEO Janice Weinman, and Hadassah Medical Organization Director General Zeev Rotstein. 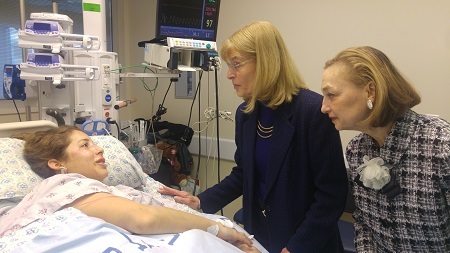 The first patient they visited was Dana Ofir from Rishon Lezion, 19, who suffered a pelvic fracture. She is an athlete and is training to be a sports instructor in the military. Her brother is also serving as an IDF officer. “It’s good that I was in shape to weather this blow,” said Ofir. Idan Levy, 20, suffered a skull fracture and a complex leg fracture. His mother told the Prime Minister that he is her only child, and that she can’t imagine how a father like the terrorist (who has four children) could kill other people’s children. Liron Telkar, from Rishon Lezion, a second lieutenant in officer’s training, was injured in her left leg and head. Her mother, Pnina Telkar, asked to thank the women of Hadassah for the amazing facility and the care. “I’ve never seen anything like it. You are angels of kindness,” she said.